Prevent sticky wire feeders, and reduce tip and liner wear and burnback with lubricants for welding applications. Metal cutting lubricants reduce tool wear and breakage while improving surface finish. Prevent corrosion and protect your equipment with anti-seize lubricants. 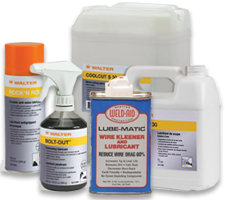 Shop Weldfabulous for your welding and metal working lubricants from top brands like Walter and Weld-Aid.